Cambodia is a fertile, forest-covered state of southwest Indo-China on the Mekong River. The country lies between Thailand, Vietnam, and Laos. Most Cambodians consider themselves to be Khmers, descendants of the Angkor Empire that extended over much of Southeast Asia and reached its zenith between the 10th and 13th centuries. In April 1975, after a five-year struggle, Communist Khmer Rouge forces captured Phnom Penh and evacuated all cities and towns. At least 1.5 million Cambodians died from execution, forced hardships, or starvation during the Khmer Rouge regime under Pol Pot.Some of the surviving Khmer Rouge leaders have been tried or are awaiting trial for crimes against humanity by a hybrid UN-Cambodian tribunal supported by international assistance. More than 50% of the population is less than 25 years old. The population lacks education and productive skills, particularly in the poverty-ridden countryside, which suffers from an almost total lack of basic infrastructure. Most of the population over age 30 need deep healing from the trauma of their losses and suffering. The estimated population in July 2012 was 15 million. Of that number,73.6% are literate and 31% live below the poverty line. 90% of the population are Buddhist, 3.5% evangelical Christian, 2.5% Muslim, 2% other, and 2% unspecified. 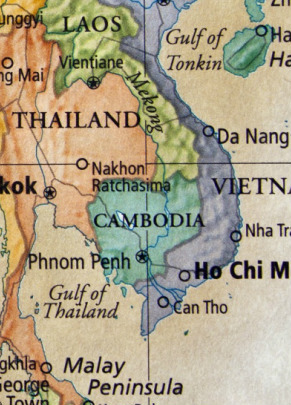 Khmer (95%) is the official language, but French and English are also spoken, and there are 22 other dialects. There has been unexpected and unprecedented church growth over the last 20 years. From only a few thousand Christians surviving into the 1990s(0.07% evangelical in 1985), believers may now top 3.5% of the population.This growth is almost entirely through church multiplication, and done by indigenous church planters and evangelists.